“What on Earth have you gotten us into?” he said – looking half skeptical yet half ready to take on the adventure. 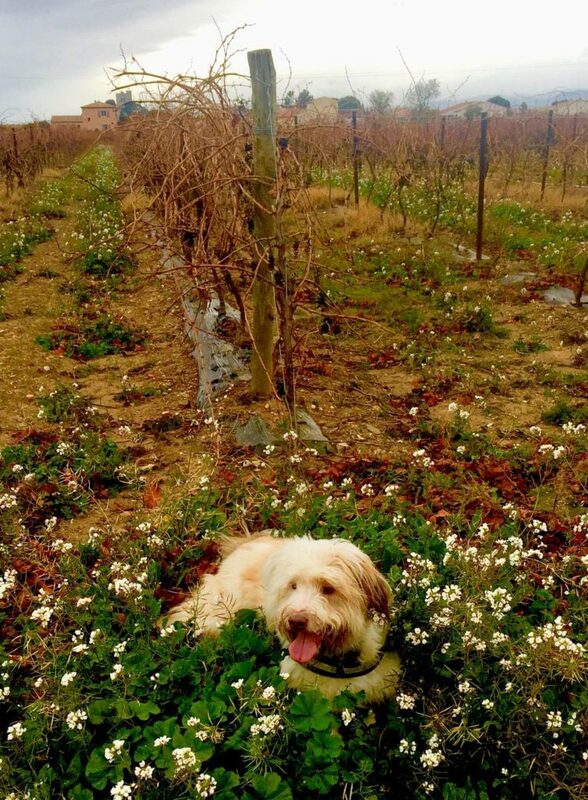 “Dog sitting in French wine country – what’s not to love? We even get to walk them in a vineyard – how cool is that?” I replied. “We don’t even know these people,” he added, stating the obvious. “This coming from the guy who dives with sharks,” I said. 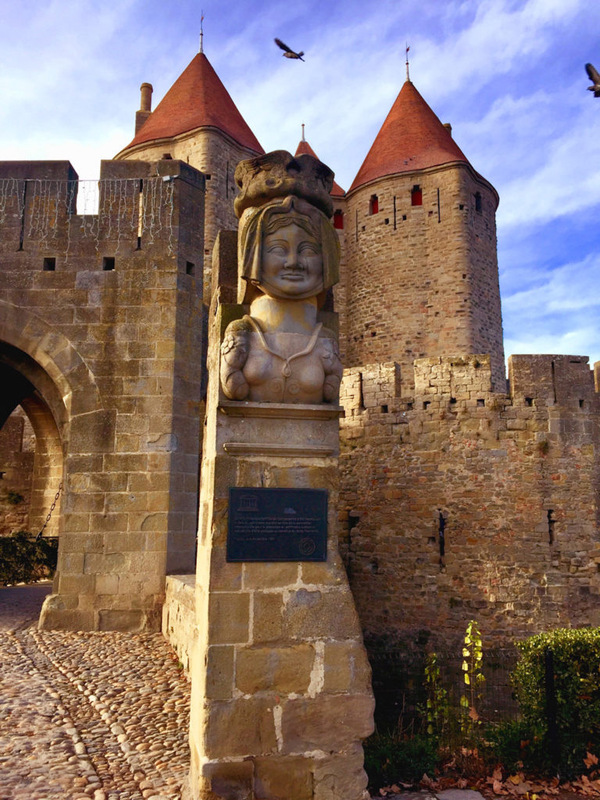 Earlier this year when we were in Carcassonne, my husband said he wished I had scheduled more time there. We’d arrived midday, had our one year wedding anniversary dinner that night at the Michelin starred La Barbacane, then left town the next morning to drive to St Tropez. I’d previously gotten away from one night stops on jam packed trips like this one, but I thought there wouldn’t be much to the ancient medieval city and that one night there would suffice. When we started to explore its twisting cobblestone streets, its quaint shops and its ancient ramparts we knew we’d need more time as it’s the largest, fully intact medieval city in Europe. When we came home I thought about it, and started to look for a reasonably priced way to return. We knew we could probably fly standby and if I got a free place to stay, there would only be the rental car and food cost to consider. A woman’s travel group I belong to had talked about housesitting websites in the past so I began to investigate. We had been thinking about getting a dog for several months so this would be a good way to try on the lifestyle and see if it fit. 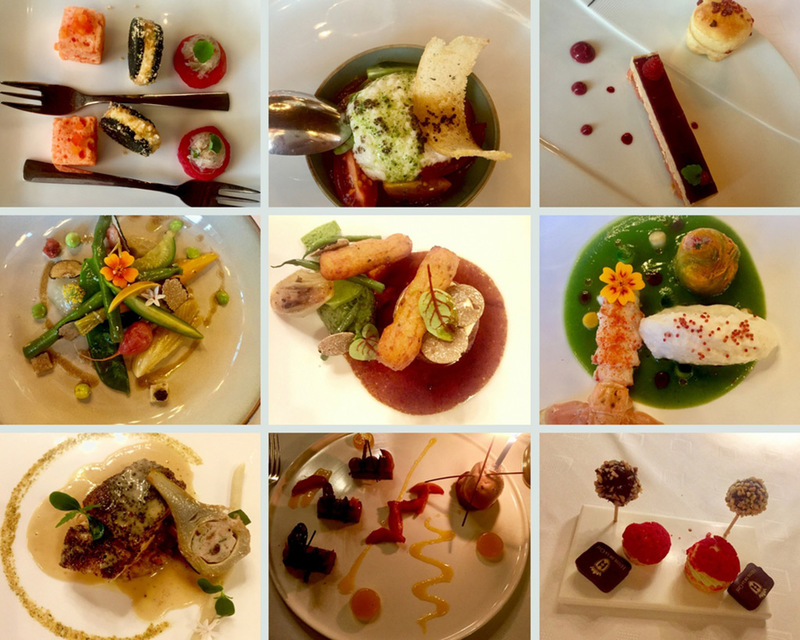 Photo collage of our one year wedding anniversary tasting menu with wine pairing meal at La Barbacane in Carcassonne. 1. An amuse bouche memorable for its roasted red pepper marshmallows on the left – it was savory good. 2. Seasonal fricasseed vegetables, summer truffle, mini toasts 3. Foie gras with smoked trout, vegan jelly made of strawberries galanga root, served with a house made brioche. 4. Turbot grilled tomatoes summer vegetables marinated with rosemary honey fennel and lemon vinaigrette 5. Charolais beef fillet, Tenderloin stuffed with foie gras, braised beef cheek, black truffle and onion infused potato churros, green bean, Perigourdine sauce. 6. Roasted scampi from mediterranean courgette velour, claws brandade, crustacean oil. 7. Grilled fish with sauce and artichoke. 8. Roasted apricot guanja chocolate creamyand almonds on pecan nuts biscuit cocoa ice cream. 9. An additional item at the end presented after paying the check. Quite an experience of high quality flavor and creativity. 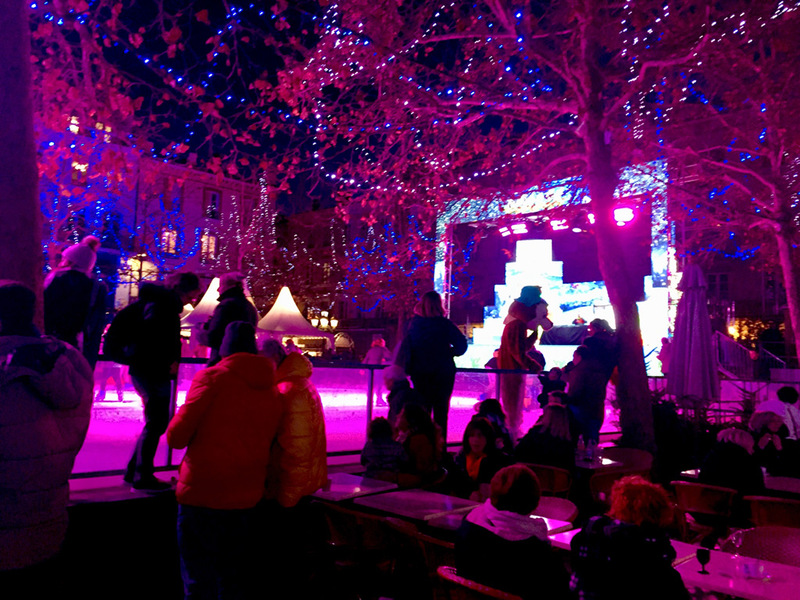 Carcassonne Christmas Fair. While we are not necessarily “into” renaissance fairs in the U.S., we love authentic villages from the time period in Europe because they are so historic and different. In this case the fair added to the whole experience. 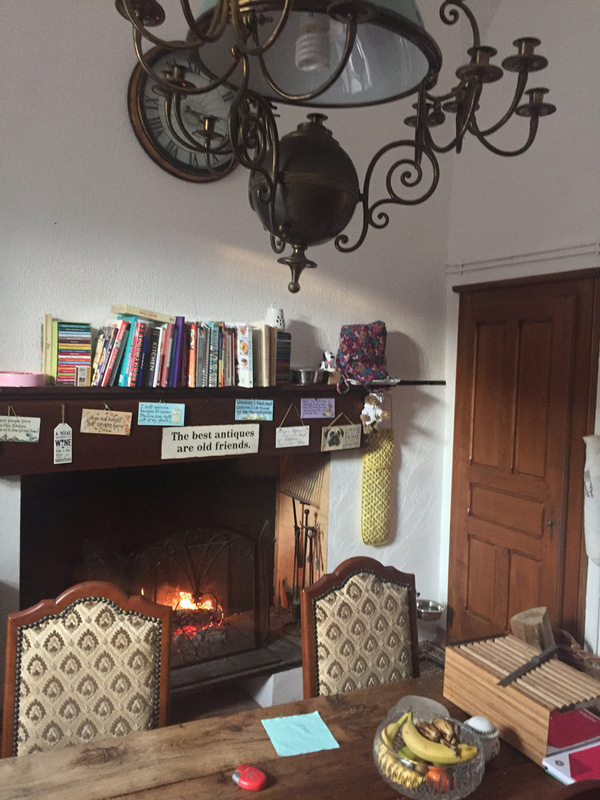 I joined the house sitting website, searched for areas near Carcassonne and quickly found a 12-day opportunity in a small village nearby. 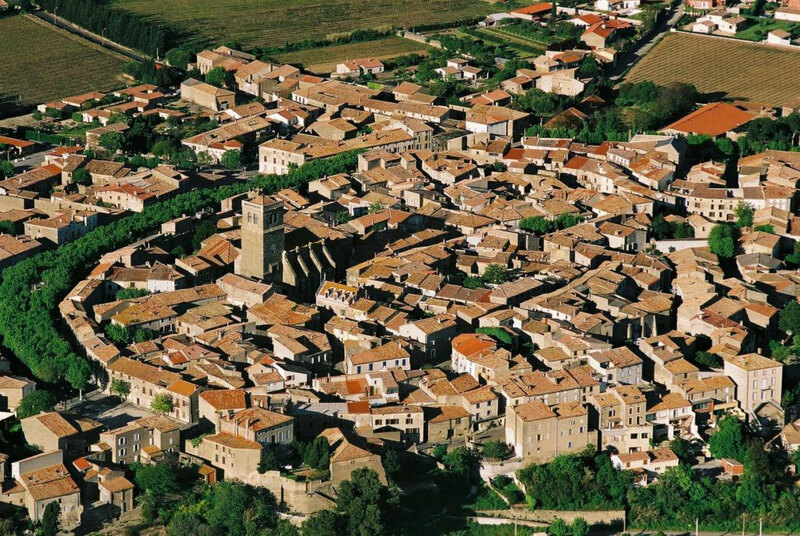 The town was set deep in wine country and the house was from the 14th century. The British expat couple who owned it also ran it as a bed and breakfast. It included two large dogs and a bengal cat in the arrangement. As long as we took care of the pets we could stay there for free – for almost 2 weeks! I quickly filled out a profile, typed an email and applied for the trip. Since I was new to the site without any reviews I assumed there was little chance I would ever hear back. My husband’s concerns notwithstanding, I had heard great things from women about this whole experience, so I forged ahead. I did the usual checking out of the couple on the internet to assuage my fears – the Facebook profiles, the positive B&B reviews, the happy house sitter reviews. I felt better. I didn’t know who this arrangement was harder for, the couple traveling across the sea to a foreign land or the couple letting these strangers into their house to care for their pets and home? Around this time I happened to watch a French movie about a couple in a rural chateau whose houseguests keep disappearing. Thanks Netflix, not helping. My husband miraculously got most of the time off so we flew into the closest airport which was Barcelona. From there we made the memorable 3-hour drive through the Pyrenees to the south of France. As we approached the village we got a little nervous, but once we met the couple we were put at ease. 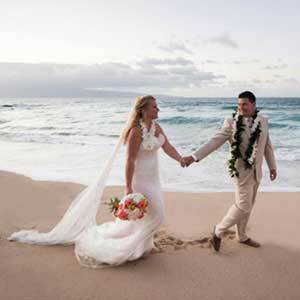 They had done this many times before and had the procedures down pat – how to make guests feel comfortable, build trust and get them ready for their stay. Community vineyard on the outskirts of the village. We accompanied the owner on the first dog walk in the vineyard. It was an expansive community vineyard, surrounded by mountains and the dogs were to be let off lead. Skeptical, we thought the vivacious dogs would never return to us but they did, on queue. We played fetch and walked them about an hour, to be repeated everyday. If you have to walk dogs, walking them in a French vineyard isn’t a bad way to do it. It was a highlight of the trip. The English sheep dog was a character and had a talent for attracting burrs to his long white fur, requiring a full bath and comb out session after every single walk. The street the house was on in the little French village set in wine country. We went to the local pub that night and met several other English speaking expats who all support each other’s life abroad. I realized this form of travel allowed one to live more like a local. How many times have we gone to a city and wished we’d made contact with a real resident to understand their experience? It adds so much to your understanding. 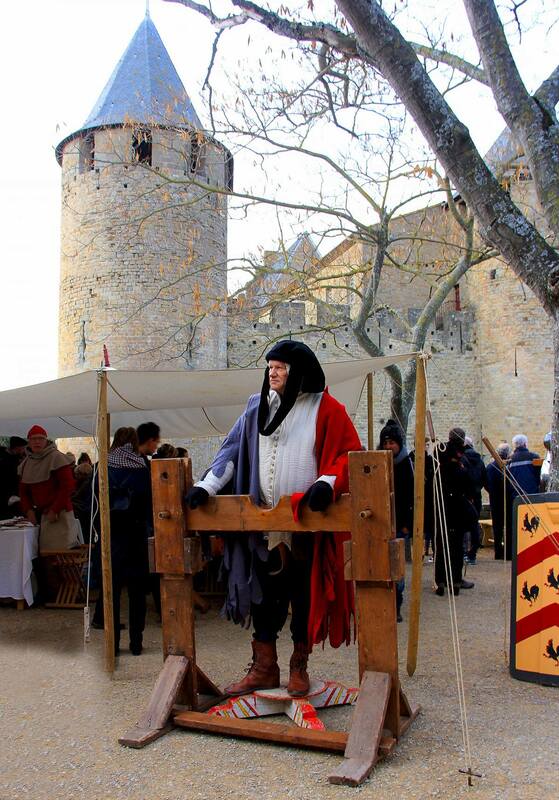 This was one way to do it – to see what small town village life was like in French wine country. The couple soon left and we were on our own in the house – tending fires in the fireplaces to keep warm. The lovable English sheep dog who attracts burrs. Old fashioned fireplace in kitchen. 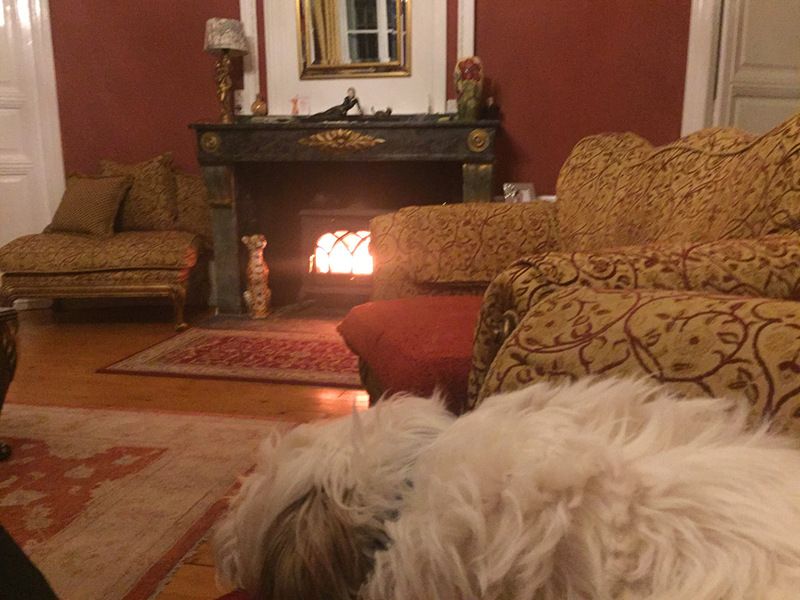 Sheep dog sitting with me in the living room by the fire. We soon realized that we couldn’t leave the dogs as long as we thought we would be able to, so any planned road trips that were too long had to be abandoned. 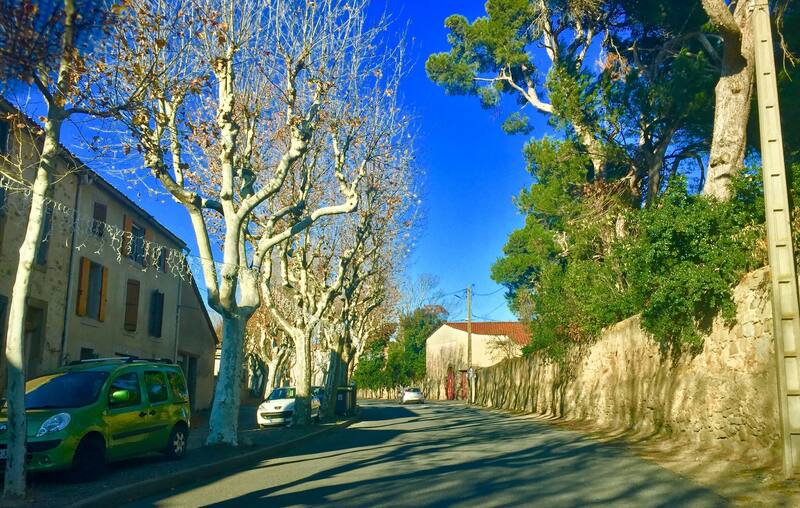 We could only be gone about 4-5 hours so we stayed local in the Languedoc – heading to small villages nearby, or off to Carcassonne, Narbonne and Toulouse. 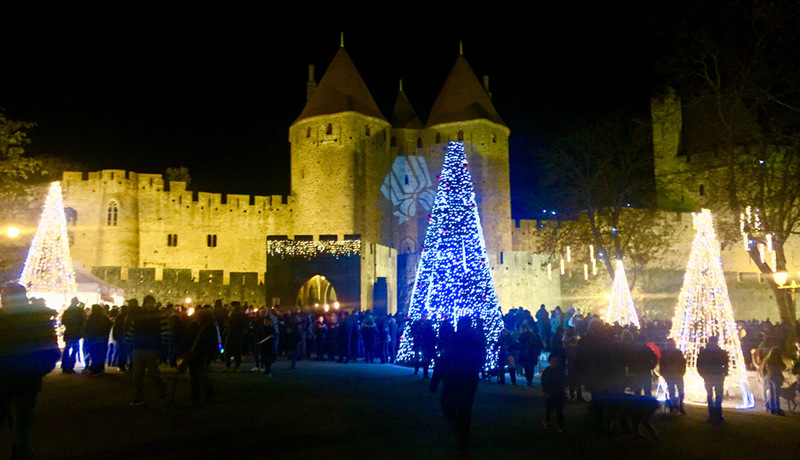 This time Carcassonne was all decorated for Christmas with the Feast of St Nicholas – a medieval fair and a candlelight parade through the city at night. 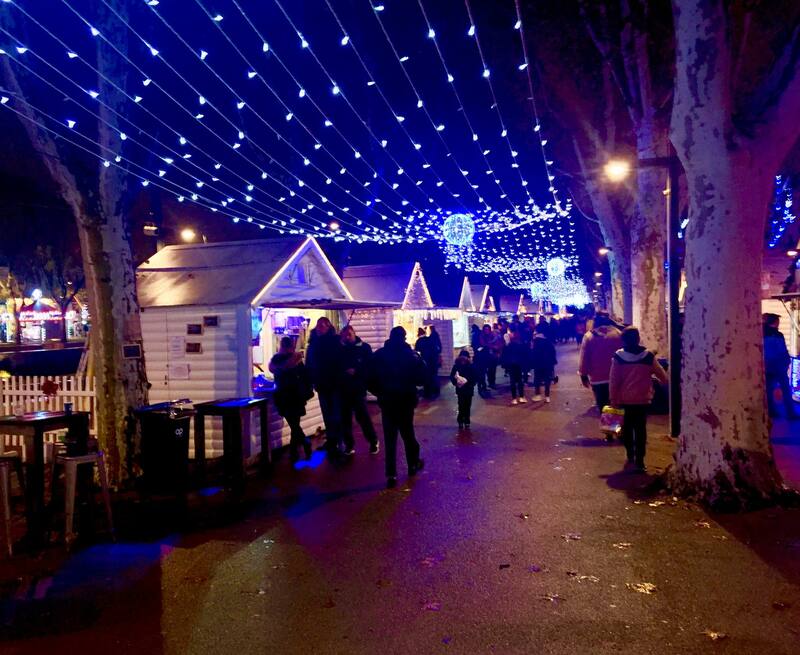 There was a Christmas market in Bastide de St Louis, the city down the hill from Carcassonne. 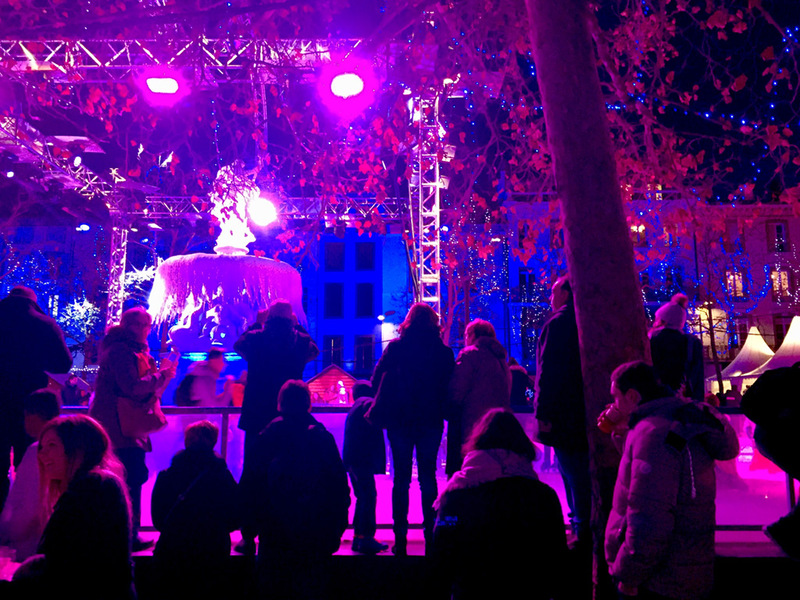 An ice skating rink dominated the square, festive music was blaring with red & blue Christmas lights bathing the entire area in a purple glow. 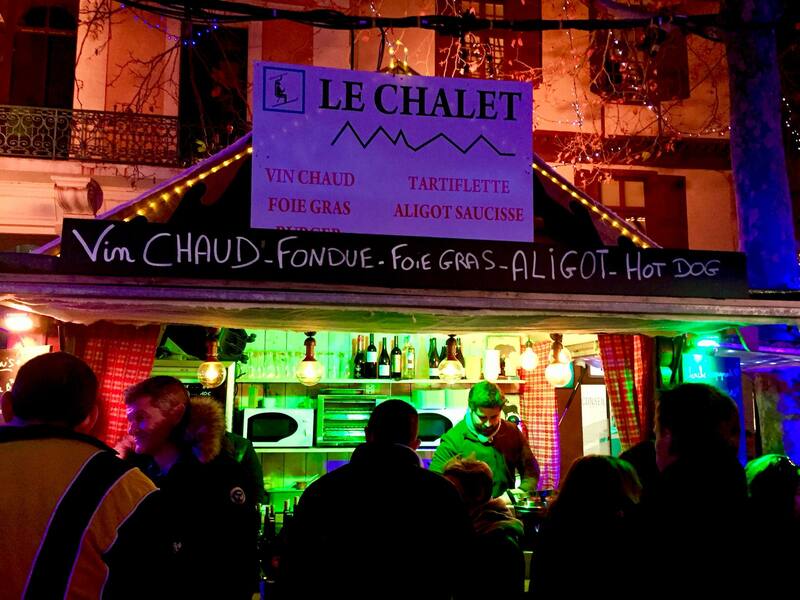 Booths in the market served vin chaud and foie gras, a speciality of the region. Christmas market booth serving foie gras. 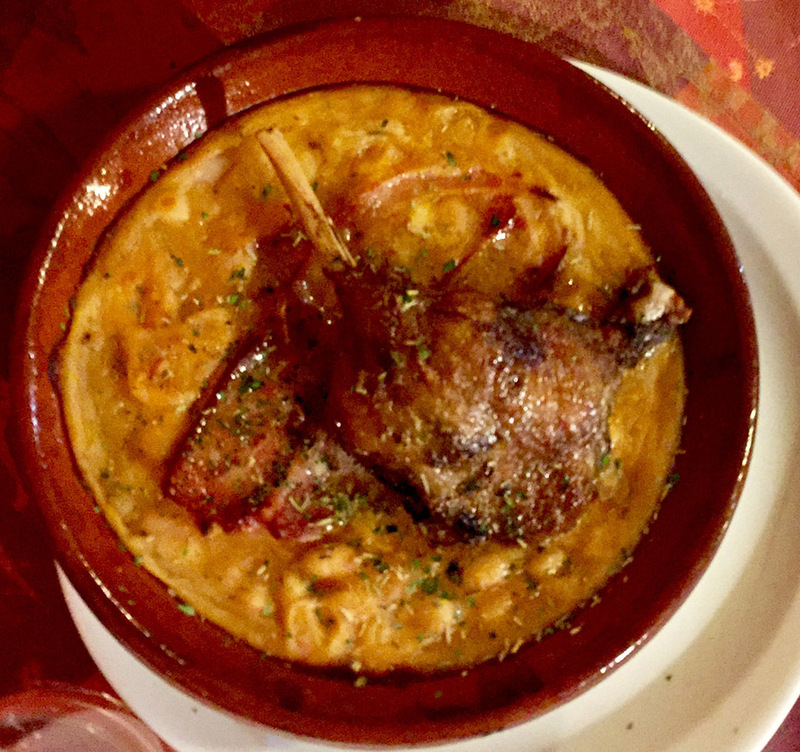 Cassoulet, specialty of Carcassonne – tastes like it looks. In Toulouse we toured the Airbus factory since my husband is in aviation. 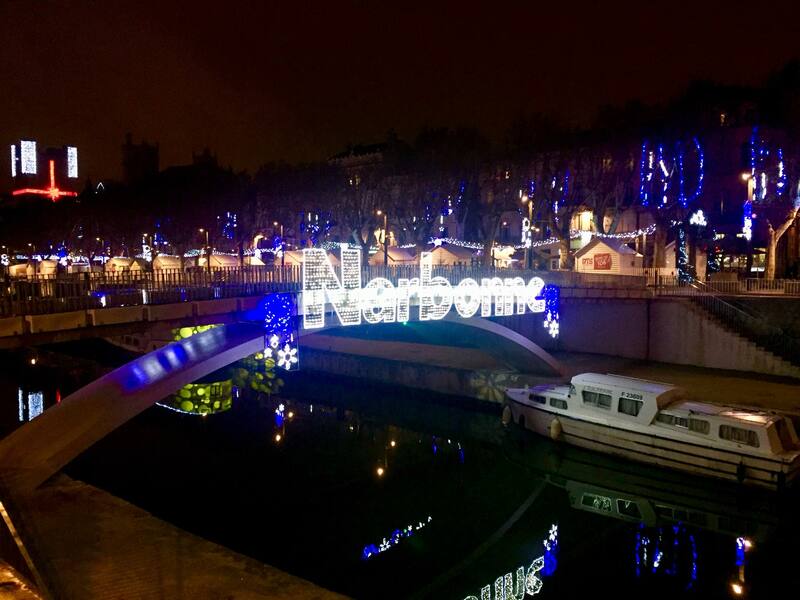 In Narbonne we went to a Christmas market and explored the city. My husband finally got to try cassoulet – a famous bean stew from the region while I tried the coq au vin, another well-known French dish. It was a quiet trip overall, the kind we are always saying we should take for relaxation purposes (sans the dogs) but that we never actually take because we pack so much in our itinerary. My husband had to return early for work so I drove him back to Barcelona and returned for a few more days. I walked the two large dogs alone in the vineyard and they successfully returned with me each day – a relief. In the days leading up to my departure I had a talk with the sheep dog, letting him know that my husband wasn’t coming back and that I too would be leaving soon. I said I had enjoyed spending time with him and would miss him. He looked thoughtful for a moment and then promptly threw up all over the chair he was sitting on. Clearly I had underestimated his attachment to us! Soon the couple came home, I gave them a good report and I bid them adieu early the next morning, happy to have made new friends in France. Will we be getting dogs? Probably not since we travel so much, but we are happy to call their dogs friends. Would we house sit again? Yes for me, if the right opportunity presented itself. For him? We’ll see.